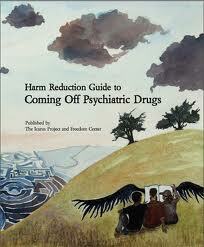 I cannot recommend the Harm Reduction Guide to Coming Off Psychiatric Drugs and Withdrawal enough. It is essential reading! The publication is written by Will Hall and published by The Icarus Project and Freedom Center. You can find out more on Will’s website. ‘This is a guide I wish I had when I was taking psychiatric drugs. Prozac helped me for a while, then made me manic and suicidal. I was sick for days after coming off Zoloft, with counselors telling me I was faking it. Nurses who drew blood samples for my lithium levels never explained it was to check for drug toxicity, and I was told the Navane and other anti-psychotics I took to calm my wild mental states were necessary because of faulty brain chemistry. I used many different psychiatric drugs over several years, but the medical professionals who prescribed them never made me feel empowered or informed. They didn’t explain how the drugs work, honestly discuss the risks involved, offer alternatives, or help me withdraw when I wanted to stop taking them. Information I needed was missing, incomplete, or inaccurate. When I finally began to learn ways to get better without medication, it wasn’t because of the mental heath system, it was despite it. Part of me didn’t really want to be on psychiatric drugs, but another part of me desperately needed help. My suffering was very serious – multiple suicide attempts, hearing persecutory voices, extreme mistrust, bizarre experiences, hiding alone in my apartment, unable to take care of myself. Therapy hadn’t worked, and no one offered me other options. I was under pressure to see my problems as “biologically based” and “needing” medication, instead of looking at medication as one option among many. For a time medication seemed like my only way out. It took years to learn that the answers, and my hope for getting better, were really within myself. When I finally left the hospitals, residential facilities, and homeless shelters I lived in for nearly a year, I began to do my own investigating. I started judging my options more carefully, based not on mis–informed authorities telling me what to do, but on my own research and learning. That process led me to co-found Freedom Center, a support community in Western Massachusetts that brings together people asking similar questions. Through the Freedom Center I discovered that I was denied a basic medical right: informed consent, having accurate information about my diagnosis and medication. I learned that mistreatment like I went through is often business as usual in the mental health profession. I came across research ignored by the mainstream media, including studies by the UK charity MIND and the British Psychological Society, which confirmed my experience: most professionals are uninformed about coming off drugs, and even frequently stand in patients’ way, sometimes ending up harming them. The Freedom Center led me to work with the Icarus Project, and together these communities of mutual support have helped many people make wiser decisions – whether it is to stay on medications when they are useful or explore the possibility of coming off when they are not. Many of us are living without psychiatric drugs that doctors told us we would need our whole lives, and despite a diagnosis of schizoaffective disorder schizophrenia I have been medication-free for more than 15 years.